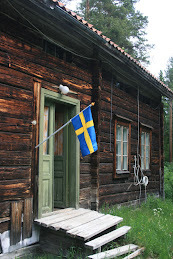 This weekend the Arctic Radio Club and Shortwave Bulletin had its annual meeting at the Kaneberg cabin, close to Halmstad in southern Sweden. Before the hurricane Gudrun swept over the area bringing down most of the trees that used to carry the antennas there used to be a lot of DX-ing at these gatherings. This time a couple of shorter antennas were erected but due to some powerful electrical disturbances most listening had to be made on FM. Still it was a nice meeting and it was great to meet many of the wellknown ARC/SWB signatures in person. ARC, the Arctic Radio Club, used to be somewhat of a secret circle and new members had to be recommended by a present member. This was mainly because there were a lot of fake loggings made by unscrupulous 'DX-ers' but today anyone who's interested can join the club. It may have kept a low profile over the years but long before the Internet it provided a very fast information service through its printed bulletin, MV-Eko (The MW Echo). This bulletin is still issued in printed form and with a deadline on Monday you will have the bulletin in your letterbox by Wednesday! Who could beat that - and who really needs the Internet? Actually, ARC has been running since 1960 and several of the original members are still active. Many of Sweden's most successful DX-ers are to be found as members of ARC and SWB and the MV-Eko has been full of exciting loggings due to this season's great propagation conditions. Also, members of the clubs are regularly providing information for the World Radio TV Handbook. 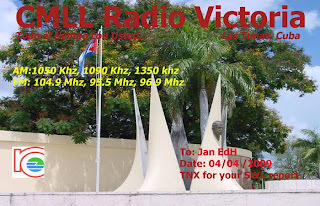 As we all know the number of stations on short wave and in the tropical bands is being drastically reduced every year but fortunately there are still lots of new finds to be made in the medium wave (AM broadcasting band). Still the SWB will continue to come out albeit less frequently. As for the MVE it will continue to be published as a printed bulletin for the time being. It is really an impressive work which is done by the editors of both bulletins and these publications are a must for the active DX-er. Next year Arctic Radio Club will be celebrating its 50th Anniversary and we will get back to that. 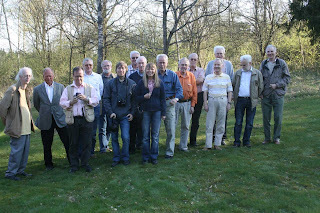 Below are the radio enthusiasts of ARC and SWB who attended the meeting. I (and Rolf Larsson) took our way to Fredriksfors this night. Nothing until we went to sleep. Not much when we startet again at 01.45 UTC. Only a few Canadian stations, the only one from USA I noticed was WEGP fading up at 05. Some Cubans and Venezuelans, for short times with good strength. Not even the Colombian stations came through. back with a "log" from this night. Pirate BBC Essex now on the air! Today it's Good Friday. I wonder what Jesus would have said about choosing such a name for the day? I suspect his Friday felt like a quite long one…. 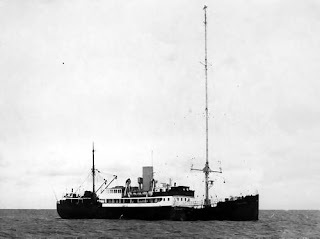 Forty-five years ago today the BBC monopoly in the UK was challenged as Radio Caroline started broadcasting from a former Danish passenger ferry off the Essex coast. Since that day British broadcasting was changed forever and one "pirate" after another took to the airwaves. During the three years which the stations were on the air British listeners got accustomed to a continous diet of music 24 hours a day and the BBC had to follow suit by establishing its own pop channel, Radio One. The m/v Caroline, previously Fredericia, home of Radio Caroline in 1964. 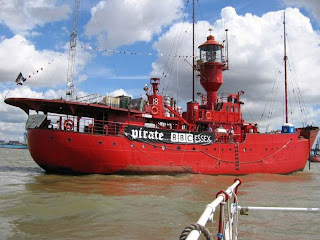 Forty-five years later BBC Radio Essex is celebrating the memory of the start of offshore radio by special broadcasts from the former lightship LV18. Many wellknown names from the golden days of offshore radio are participating. At the time of writing I am listening to good old "Cardboard Skues", Keith Skues, who in the 1960s could be heard on both Radio Caroline and Radio London (BigL). If you want to enjoy some real radio nostalgia you can listen in to Pirate BBC Essex over the web. You may also be able to pick up the signal on MW 729, 765 or 1530 kHz although these frequencies are pretty crowded. The transmissions will continue until April 13. Incidentally, the LV18 is also featured as a broadcasting vessel in thed current film The Boat that Rocked the World. "Your "Victoria" is correct but when you consult the World Radio TV Handbook you don't get much help. It is indeed Radio Victoria but the call is not correct. While searching the web I found that the call according to http://www.upec.cu/baul/37.html is really CMLL since 2005. In the WRTH it is listed on 1040, 1050 and 1060 under its old call CMKT. The station ID can be found on the web but is not easy to find as the station doesn't have a conventional website but can be found on http://www.tiempo21.cu/. The ID which has been uploaded, and which I enclose, is not completely in accordance with what you have recorded where you can hear a female voice in the middle and at the end of the ID. Besides at least one AM frequency has been changed (1040?) and the FM frequency does not sound as 94.5 but something different; I leave it at that. Thus you have found a news item which once again shows why Jens Frost did not like the epithet "The DXer's Bible". He realized that the book contained too many errors. Listen to the old recording which I dug up last week. It's not on the web but the Fredriksfors team maybe can upload it?" Back at the shack for a couple of days and there are still some NA stations coming through although nothing special. Loggings by RFK and JE.